Full disclosure: This is how my mom makes tamales. She learned to cook from her mother, aunts, older sisters, growing up in a small town nestled in rural Jalisco, Mexico. They're the kinds of cooks that don't use exact measurements. They.just.know.how.much! It's ridiculous. How in the world am I suppose to learn? Just observe closely mija...okay but that's easier said then done. Still though, I've been trying to document all her Mexican dishes so I can have them forever at my disposal. However like I said, exact details are tricky to finalize. A lot of it just ends up being "left to taste". Maybe that's just what it is. All up to taste. Maybe it's that simple and I'm just over thinking things. Whatever the case, I'm going forth with this challenge and sooner or later I will have my own little book full of mom's recipes or rather recetas de amá. I honestly don't like eating anyone else's traditional Mexican food. I'm not saying my mom's Mexican food is the best but she knows what she's doing. This recipe yields about 60! It really depends on two things though; how big/long and full of meat you want them. Place the 8 guajillo chiles in warm water, completely submerged, let them sit for about 2 hours meanwhile you get going on the everything else. Same with your corn husks, take them out the bag, carefully separate them and place them all in a big bowl or sink submerged completely in warm water. Let them sit to moisten until soft/flexible. In a deep pot or big enough sauce pan place pork and fill with water just enough to cover the meat completely. Add the bay leaf, 2 garlic gloves, 1/4 of the onion, 1 teaspoon of salt, peppercorns, thyme and 1 tablespoon oregano. Cover and simmer until pork is soft and tender. When the pork is done, take it out of the pot. Save the broth, you'll need it but you can discard the pieces of garlic and onion. Allow pork and broth to cool a bit. Cooling the broth makes it easier to remove some of its fat, if you'd like to do that. Shred the pork using two forks. The fineness of the shredding is up to you. It can be really stringy or more on the chunky side, whatever you want to get the job done. Now back to your chiles. Take them and remove their stems and seeds from the pods. Throw the chiles in the blender with 2.5 cups of water. Add 1 teaspoon salt, black ground pepper, ground cumin, 1/4 of an onion, the remaining 3 garlic cloves, 1 tablespoon oregano. Blend until thoroughly mixed. In a large bowl place your masa flour, add 2 tablespoons of baking powder and the pork broth. To this you will be adding the lard. In a frying pan, heat and melt down your lard. We actually used pork fat saved from a previous pork rinds cooking. Once melted down pour it into your flour mixture. Leave like a tablespoon of the lard in the frying pan. Add the chiles blend and then the shredded pork. Let it all cook for 20 minutes. Knead you masa dough until it's evenly mixed. Mom's tip: You know it's ready when you place a little bit of it on your skin and it leaves a shimmer of grease without sticking. Give it a tiny taste for saltiness, if your lard was not already salted. Shape dough into balls. Place a ball on the inside of a corn husk. Press it down to 1/4 - 1/2 inch thickness so spread out the masa and then add a dollop of your chile shredded pork. Fold in the sides of the husk and fold up the bottom to create your tamale. In a large pot place a steamer basket. We used a perforated pizza pan upside down. Fill with about 2 inches of water. Arrange the tamales in there with their open end up. Bring the water to a boil then cover and let them all steam for 40-50 mins or until the masa is firm. When you think they're done, remove them from the pot and let them cool slightly, then unwrap your tasty Mexican gift! P.S. Your choices for tamale fillings are endless. 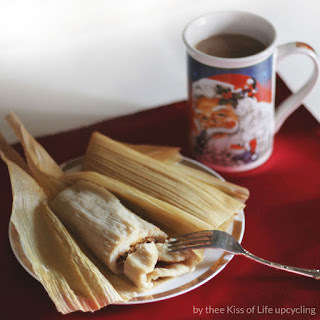 People from all over hispanic countries have their own renditions of tamales. Some people make them with chicken, some people go vegetarian and do cheese stuffed poblano peppers while others make them a sweet fruit filled dessert. Basically once you know how to prepare or make the masa dough you've got yourself set for limitless options of filling. Enjoy! This looks delicious! Will be trying it today. Thanks for the recipe. I know this post is from last year, but I just made this recipe and it's the best I've ever had! Thank you! hello! i noticed that you listed 5 garlic cloves on the ingredients list but only used 2?? am i missing where it says what to do with the rest of the garlic ?? The remaining 3 garlic cloves go in the blender with the chiles. Thank you for pointing that out! I have edited it into the instructions. Do I still make my masa like yours if I use masa from a molino? The lard, broth and such? Hi, I'm so sorry for the really late reply but I am just now seeing this. I believe you would not need to since the masa is then ready to go right? like it's no longer dry flour. The lard and broth add flavor and wet to the dry. We've made tamales before mixing half store bought prepared masa with half fresh made and it works too. Most times the store bought kind is tougher or the flavor is off. I hope that helps some, sorry again.